Another year has all but come and gone... But now, it's almost National Séance time, again. Hoorah! So, how does it work? Well, for the past four years, we've asked fans across the globe to play their copies of Ghostwatch at exactly the same time on Hallowe'en Night, and Tweet about the show as it happens on Twitter to help mark the anniversary of its first and to date, only UK television broadcast. 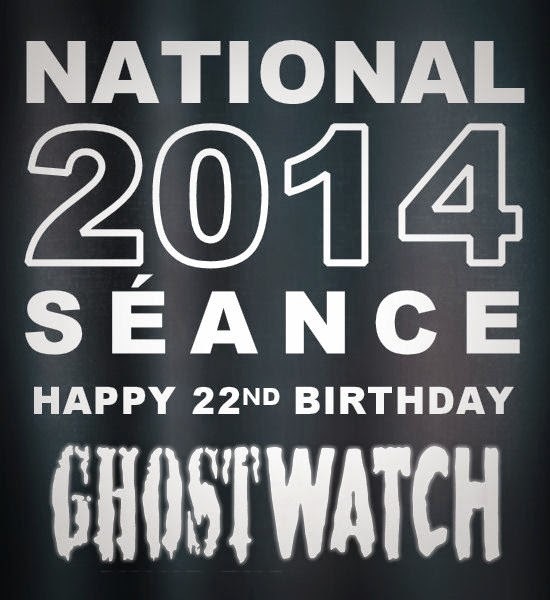 It's great that National Séance has now become something of a tradition since our first event way back in 2010 - mostly as it's a genuinely fun way of connecting with other fans and celebrating the show and its legacy. For the show's Twentieth Anniversary, you might recall, we even made it onto the fabled UK Trending Board, officially reaching as high as Sixth Place. Wowzers. Now, here's where it gets tricky. Depending on whether you plan on using the BFI or 101 Films release, you may need to start your DVD slightly earlier/later than 21:25. If you're watching from the BFI DVD, you can start playing the above video at precisely 21:24:14 and then start running Ghostwatch immediately after. If you're using the newer 101 FILMS release, you can do exactly the same, but only need to watch the opening Continuity Announcement. As soon as you see the retro, blue-tinted TV Screen that heralds the start of the classic Screen One ident, that's the moment to hit 'Play' on your DVD menu. Adding the hash-tag #Ghostwatch to the end of every Tweet can be a handy way of keeping track of the evening's conversation. In addition to your personal tales of terror, we're especially on the lookout for artwork, photos, audio or even video, perhaps of your own personal screening. The more creative and fun your message, the better!